From FreshDirect to Walmart and Amazon to Blue Apron, consumers now have more options open to them to fill their every need for foods and beverages and shop without stepping foot inside a grocery store. The world of online food retailing has risen from the ashes of the dot.com-bust era, when the darlings of the fledgling internet food retailing industry, Webvan and HomeGrocer.com, flamed out. Whether simply browsing the internet for meal and recipe ideas or undertaking a major grocery shop, the fit between in-home, mobile behaviors and the relatively complex task of in-store grocery shopping has increasingly developed positive synergies with today's online grocery business models. 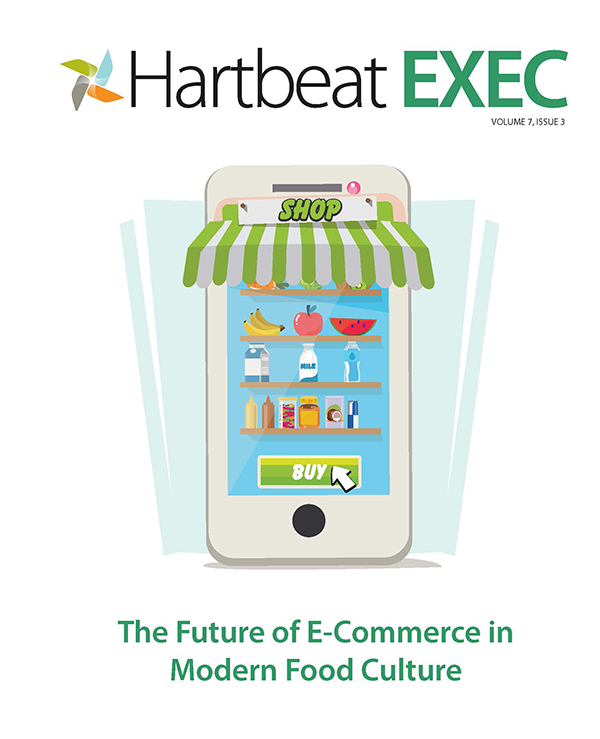 This edition of Hartbeat Exec, The Future of E-Commerce in Modern Food Culture, explores the growth of e-commerce food sales and takes a deep dive into how online food shopping may accelerate faster than current data suggest. Read the following intro to the report, then download your free copy. The recently completed merger of Amazon and Whole Foods has dramatically altered the possible future of e-commerce food and beverage in the U.S. market. At the same time, high-level sales trends and new consumer research point to the increasing likelihood of a medium-term acceleration in online grocery market share. But, to be honest, we do not see many people in the retail ecosystem taking this as seriously as they probably should. The popular reasons to downplay the online threat are all based on a flawed contextual understanding of how U.S. shopper behavior could change in the next ten years and the effect of this behavioral change on our food retail ecosystem. Here are the top reasons naysayers use to dismiss the trend’s impact: a) online grocery share is very, very low, b) even at low double-digit growth, online grocery share will be “small” for some time, c) plenty of Millennials are showing up in my stores each week: “I just need to merchandise to them to protect my share,” and d) Boomers are fast retiring and will have plenty of time to shop where they’ve always been most comfortable: brick and mortar. Part of the challenge in imagining the future pace of growth in online food and beverage sales is making sure that we examine both supply and demand variables that could affect the sales curve. In small, emerging market segments or channels, small fluctuations in availability can suddenly unleash exponential, latent demand that had been building quietly for some time. Likewise, small behavioral experiments at the shopper level can raise awareness of the previously unacknowledged behavioral costs of prior habits, igniting behavioral change the individual actor herself never saw coming. The biggest immediate question in front of us regarding the future growth in online food shopping is: are e-commerce food sales growing linearly or nonlinearly? Why do we care about this? Because nonlinear growth tends to sneak up on all but the most long-term strategists … and most consumers as well. It’s the frog-boiling-in-a-pot-of-slowly-heating-water dilemma.